Journal of Combinatorics, 8 no. 3 (2017), 439-474. Roy Ronen, Glenn Tesler, Ali Akbari, Shay Zakov, Noah A. Rosenberg, and Vineet Bafna. PLoS Genetics, 11 no. 9 (2015), e1005527 (electronic, 27 pages). in Teresa M. Przytycka (Ed. ), Proceedings of RECOMB 2015, Lecture Notes in Computer Science, Vol. 9029, pp. 276-280. Springer, Cham, 2015. Sergey Nurk, Anton Bankevich, Dmitry Antipov, Alexey A. Gurevich, Anton Korobeynikov, Alla Lapidus, Andrey D. Prjibelski, Alexey Pyshkin, Alexander Sirotkin, Yakov Sirotkin, Ramunas Stepanauskas, Scott R. Clingenpeel, Tanja Woyke, Jeffrey S. Mclean, Roger Lasken, Glenn Tesler, Max A. Alekseyev, and Pavel A. Pevzner. Journal of Computational Biology, 20 no 10 (Oct. 2013): 714-737. Proceedings of the National Academy of Sciences U.S.A., 110 no. 26 (2013), E2390-E2399. Published online ahead of print June 10, 2013. Genome Research, 23 no. 5 (2013) 867-877. Published online ahead of print April 5, 2013.
in Proceedings of RECOMB 2013, Lecture Notes in Computer Science, Vol. 7821, pp. 158-170 (2013). PLoS Computational Biology 9 no. 2 (2013), e1002901 (electronic, 19 pages). Published online February 28, 2013. Bioinformatics, 29 no. 8 (2013), 1072-1075. Journal of Computational Biology, 20 no. 4 (2013), 359-371. Online ahead of print July 17, 2012.
in Benny Chor (Ed. ), Proceedings of RECOMB 2012, Lecture Notes in Bioinformatics, Vol. 7262, pp. 200-212. Springer, Heidelberg, 2012. Anton Bankevich, Sergey Nurk, Dmitry Antipov, Alexey Gurevich, Mikhail Dvorkin, Alexander Kulikov, Valery Lesin, Sergey Nikolenko, Son Pham, Andrey Prjibelski, Alexey Pyshkin, Alexander Sirotkin, Nikolay Vyahhi, Glenn Tesler, Max Alekseyev and Pavel Pevzner. Journal of Computational Biology, 19 no. 5 (2012), 455-477. Nature Biotechnology, 29 no. 11 (2011), 987-991. Journal of Computational Biology, 18 no. 11 (2011), 1625-1634. Nature Biotechnology 29 (2011), 915-921. Advance online publication, 18 Sep 2011.
in V. Bafna and S.C. Sahinalp (Eds. ), Proceedings of RECOMB 2011, Lecture Notes in Bioinformatics, Vol. 6577, pp. 238-251. Springer, Heidelberg, 2011. Bioinformatics, 26 no. 22 (2010), 2856-2862. Communications in Information and Systems, 10 no. 1 (2010), 1-22. Lecture Notes in Computer Science / Lecture Notes in Bioinformatics, Vol. 5724, Springer Verlag, 2009, pp. 220-232. ``Computational Tools for the Analysis of Rearrangements in Mammalian Genomes'' in Bioinformatics, Volume I: Data, Sequence Analysis and Evolution (Jonathan M. Keith, Ed. ), Methods in Molecular Biology, Vol. 452, Humana Press, 2008, 431-455. Special Issue on the RECOMB Satellite Workshop on Comparative Genomics 2007, Journal of Computational Biology, 15 no. 8 (2008). Preface (written by Glenn Tesler and Dannie Durand), pp. 943-946. Whole issue (edited by Glenn Tesler and Dannie Durand). Electronic Journal of Combinatorics, 15 (2008), no. 1, Research Paper R105, 56 pp. (electronic). ``Computational Tools for the Analysis of Rearrangements in Mammalian Genomes'' in Phylogenomics (William J. Murphy, Ed. ), Methods in Molecular Biology, Vol. 422, Humana Press, 2007, 145-170. Lecture Notes in Computer Science / Lecture Notes in Bioinformatics, Vol. 4751, Springer-Verlag, 2007. Genome Research, 17 no. 11 (2007), 1675-1689. Briefings in Bioinformatics, 8 no. 2 (2007) 138-139. Genome Research, 16 no. 3 (2006) 311-313. PLoS Computational Biology, 2 no. 2 (2006): e14 (electronic, 12 pages). Related material: UCSD press release (July 21, 2005) and 2nd copy, UIUC press release (July 21, 2005), Texas A&M press release (July 21, 2005), San Diego Union-Tribune (July 22, 2005, page B2), New York Times (August 30, 2005, Science section). Genome Research, 15 no. 1 (2005), 98-110. Related material: UCSD press release, NIH press release, Union-Tribune articles (Dec. 10 and 15, 2004). Genome Research, 14 no. 9 (2004), 1786-1789. RECOMB '04: Proceedings of the eighth annual international conference on Research in computational molecular biology, San Diego, CA (2004) 213-222. Related material: UCSD press release (March 31, 2004), NIH press release (March 31, 2004). Genome Research, 14 no. 4 (2004), 507-516. We also authored the cover illustration for this issue! 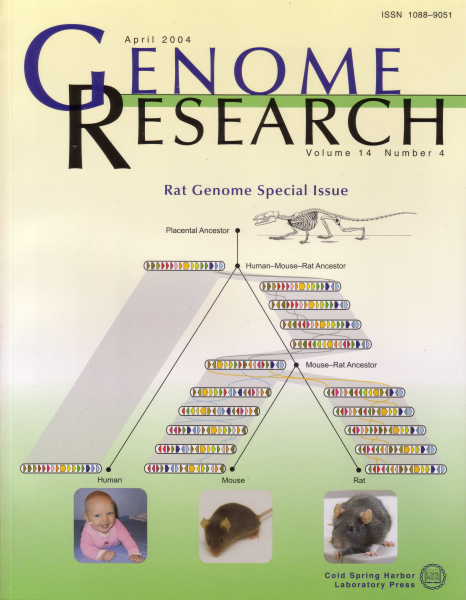 G. Bourque, W. Murphy, M. Krzywinski, P. Pevzner, and G. Tesler, Genome Research, 14 no. 4 (2004), cover. Detailed four-way comparative mapping and gene order analysis of the canine ctvm locus reveals evolutionary chromosome rearrangements, Genomics, 83 (2004), 1053-1062. Reconstructing the genomic architecture of mammalian ancestors using multispecies comparative maps, Human Genomics, 1 no. 1 (2003), 30-40. Proceedings of the National Academy of Sciences U.S.A., 100 no. 13 (2003), 7672-7677. Related material: UCSD press release (June 16, 2003), (Oct. 10, 2003), North County Times (June 29, 2003), PNAS commentary (Sep. 30, 2003), Discover Magazine (Nov. 2003). RECOMB '03: Proceedings of the seventh annual international conference on Research in computational molecular biology, Berlin, Germany, (2003), 247-256. Genome Research, 13 no. 1 (2003), 37-45. Journal of Computer and System Sciences, 65 no. 3 (2002), 587-609. Related material: UCSD press release (Dec. 4, 2002)*, NIH press release, Nature mouse genome web site, San Diego Union-Tribune (Dec. 5, 2002)* (U-T print version included front page photo not available online). * Articles include interviews with Pavel Pevzner and Glenn Tesler. Bioinformatics, 18 no. 3 (2002), 492-493. Journal of Combinatorial Theory, Series A, 91 no. 1-2 (2000), 49-83. Methods and Applications of Analysis, 6 no. 3 (1999), 363-420. Séminaire Lotharingien de Combinatoire, B42m (1999), 45 pp. (electronic). Journal of Combinatorial Theory, Series B, 78 (2000), 198-231. Advances in Mathematics, 142 no. 2 (1999), 244-334. Journal of Combinatorial Theory, Series A, 85 (1999), 208-227. Advances in Mathematics, 123 no. 2 (1996), 143-222. Ph.D. thesis, Massachusetts Institute of Technology, 1995. Advances in Applied Mathematics 14 (1993), 217-225.